Goldsboro, NC Bojangles'® Tands, INC. Store #26 - Bojangles'® / Tands, Inc. Need southern-style fast food that’s also fresh and filling? It’s Bo Time! Goldsboro, NC loves our friendly service and famous Bojangles’® food, like our fried chicken, biscuits, and fixin’s like Dirty Rice® and Cajun Pintos®. We open early and serve food to satisfy your cravings all day—for breakfast, lunch, dinner, and any time in between! 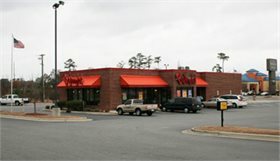 This Goldsboro Bojangles’® is located on NC Hwy 111 South, close to Seymour Johnson Air Force Base. We’re a favorite for pilots, Air Force personnel and their families, and we are proud to serve those who serve our nation. The frequent jet flyovers are always an exciting addition to your Bojangles’® visit!